The suddenly Darvish-less Rangers appear to be the worst team in the American League. Injuries melted the 2014 campaign into a puddle of sullen goop. With Darvish expected to miss the season and part of 2016, Texas is back in familiar territory. The club is a strange mixture of name brand veterans and unestablished nobodies. If you stare long enough, you might find a hint of upside or a whiff of a bounce back. It won't be enough to save the club this year, but it might lead to some fantasy opportunities. As with the Braves and Phillies, we're looking at the Rangers in large part because they're cheap. Not long ago, there was star power atop this rotation. Now we're left with a couple mildly useful starters and a couple guys who aren't even owned in my dynasty league (20-team, 48 player rosters). Holland is by far the most compelling pitcher on the roster. The lefty missed most of the 2014 season when his dog and a set of stairs interacted to shred his knee. When he returned to action, he featured excellent command. His slider was particularly sharp. His strikeout numbers were low because his primary fastball induced very few whiffs. He's likely to improve in that regard. The total product is a low-3's ERA pitcher – and that's if he can maintain the career best walk rate. Projection systems think the most likely outcome is a 4.00 ERA with 7.60 K/9 and 2.60 BB/9. I'm not inclined to disagree, but there is definitely some upside. Remember, a projection always comes with a range of outcomes. Holland is unlikely to earn many wins, and there could be some shaky defenders behind him. Gallardo is the other guy to watch. I worry about pitchers who are new to the Rangers. While Milwaukee's stadium is possibly more hitter friendly than Globe Life Park, Gallardo will have to survive the blistering Texas summer start after start. Maybe that's a forced narrative, but it's one reason for concern. Of course, we don't really need a tortured reason to avoid Gallardo. His stuff is perfectly adequate for a major league starter, but it leaves a lot to be desired in a fantasy setting. Projections call for a strikeout rate around 7.00 K/9, 2.90 BB/9, and a 4.10 ERA. For the vast majority of leagues, that's well below replacement level. If the Rangers possessed a first rate offense, Lewis and Detwiler might be worth the occasional stream start. Alas, that is not the case. Given that Lewis and Detwiler are likely to crack the opening day rotation, you can rest assured that the other guys are not fantasy targets. Nick Tepesch, Nick Martinez, and Anthony Renaudo could all sneak onto the roster. Martinez looks visually impressive at times, but the results aren't there. Martin Perez and Matt Harrison could return sometime around midseason, but they're both low ceiling pitchers. Top prospect Chi-Chi Gonzalez offers a hint of upside, but he's yet to demonstrate big strikeout ability in the minors. Neftali Feliz is a rather curious beast. Once capable of consistently pumping 97 mph fastballs, Feliz lost velocity upon returning from Tommy John surgery. He averaged just 93 mph last year, but there is a silver lining – he threw 96 mph in September. We'll want to keep an eye on the radar gun this spring. Feliz is an extreme fly ball pitcher. Someone with a feel for advanced statistics may look at his .176 BABIP and dismiss his performance. He's certainly in for some regression on batted balls, but not as much as you'd expect. He induces infield flies at a 20 percent rate. He's done it year after year, regardless of his velocity. Those infield flies are the in-play version of a strikeout – they're automatic outs. You won't get fantasy credit, but you can count on him to outperform his ERA estimators and projections. If we're lucky, he'll add a few strikeouts too. Last year he posted just 5.97 K/9 with 3.13 BB/9 and a 1.99 ERA. Owners are rightfully wary of Feliz, which makes him a reasonable buy-low candidate. He's currently the 21st reliever off the board with an ADP of 175 in NFBC leagues. If Feliz flops, Scheppers and Fujikawa will probably get the next crack at saves. Scheppers fell apart last year due to elbow pain. He's healthy now after rest and rehab, but we should consider him an elevated risk. Scouts always said he would spend a lot of time on the disabled. We could be seeing the start of that. Fujikawa is a sneaky addition to the bullpen. His four pitch mix includes a good cutter and splitter. He's not a typical closer, but he should be good enough if the opportunity lands in his lap. Here is where we find some opportunity. Adrian Beltre remained a force throughout 2014. 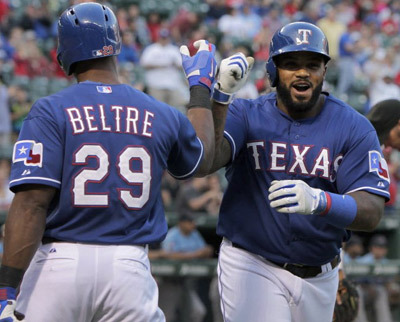 Shin-Soo Choo and Prince Fielder used to be forces in their own right. Now they'll try to bounce back from injury. Elvis Andrus claims to be in top condition after slacking the last few offseasons. We'll see. Rougned Odor is a popular semi-sleeper. The 21-year-old debuted last season after injuries forced the Rangers to dig deep into the system. With most clubs, he would still be in the minors. Odor has solid contact skills, decent power for a second baseman, and ability to swipe 10 to 20 bases. He might prove frustrating on a day to day basis, but he should produce decent 5x5 stats over the course of the season. Even though he's been the 16th second baseman selected, his NFBC ADP is 256. Leonys Martin has emerged as one of those useful, boring veteran types. The hint of power he flashed earlier in his career never developed. He's coming off two consecutive seasons of at least 30 steals. He's generally slightly below average in the other four primary categories, but that can work at the right price. NFBC drafters are not sleeping on him. He's going 40th overall, sandwiched between guys like Brett Gardner and Melky Cabrera. He's going much later in other formats. Choo is actually going a few picks later than Martin even though he possesses much higher upside. The Rangers are taking it easy on him this spring, so expect him to play four or five days a week in the early going. Choo should recover his 15 to 20 home run power with health. It's unclear if he'll continue to run, but I wouldn't count on more than a handful of stolen bases. Playing through injury led to a career high strikeout rate, so he should improve upon the .242 average. An additional injury could derail any potential production, so be wary. Try to fit him into a platoon role if you can. The other health risk is Fielder. He's discounted compared to last season, but owners are still taking an early risk on him. He's being drafted ahead of Joey Votto, which I consider a special breed of insanity. People remember Fielder's bout of futility prior to injury, but it's easy to forget that his plate discipline remained superb. It was his power that evaporated. It's hard to anticipate how he'll perform this year. He'll fall in some leagues, perhaps to the point where the gamble makes sense. The Rangers went from the best team in the AL West to an injured mess in the span of one season. With Darvish out, they're the 28th ranked team in our power rankings. If certain veteran hitters bounce back, they could climb the rankings. An ugly rotation and difficult division ensures that the club won't contend. As with the other bad clubs we've discussed, a few value picks can be found. Holland, Feliz, and Odor all flash some upside, but they aren't high floor picks either. Any Ranger you select besides Beltre comes with a heavy dose of risk.